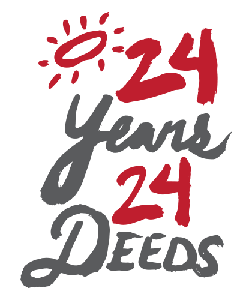 We Just Birthed a Hashtag: Welcome to the World, #24Years24Deeds! Ok, quick poll: Who among the million-bajillion people reading this post does NOT like it when people do good deeds? So anyhow, all of this is to say: It’s pretty soul-affirming when you hear about local people doing wonderful things to help our local community, right? We think so. As an agency, it’s even part of our mission statement: Doing good is inherent to who we are. So last year, we undertook 23 good deeds for the community — one for every year our agency has been in business. And as a result, we felt good, we learned about amazing people doing spectacular things, we even created opportunities for future deeds. And we set a pretty high bar for ourselves. But guess what? We’re about to take that bar — and lift it up a notch. The year 2017 represents 24 years in business for the Estipona Group, and as such, we’re at it again. Please join us as we undertake a whopping 24 good deeds this year. Read this to get a sense of why we do what we do, and also use the handy-dandy form at the bottom to suggest to us a community project, a contribution or a philanthropic partnership. Thanks in advance for the help, to all of you million-bajillion people following along. Even that dude in the back, who obviously just needs a hug.